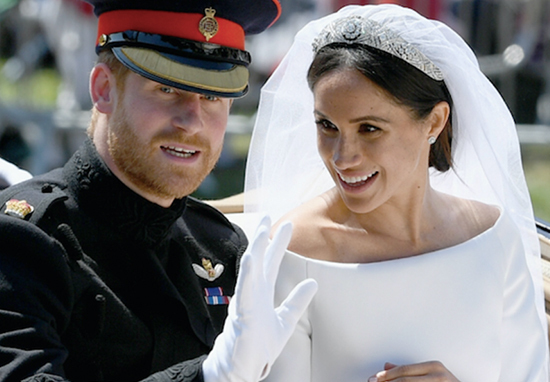 Last weekend the world watched on in awe as Prince Harry wedded American actress Meghan Markle in an incredibly long, passionate, and lavish wedding ceremony at Windsor Castle. Prince Harry, now the Duke of Sussex tied the knot with Meghan, now the Duchess of Sussex as a result of their marriage. Not that they merely got married for the sake of the titles. But just what does a young Duke and Duchess need? Yep. You guessed it in one. A coat of arms. Check it out below. However people have noticed something sinister in the coat of arms. Yes, something very sinister indeed. Can you spot it? Look closer. Spot it yet? You’re getting good at this aren’t you. Spotted it in seconds! The crowns on this bloody thing are strangling the life out of bird and lion. Now you tell me this, Queenie, what the hell is that all about?! Why is the crown around the dove's neck? Even for an American like me, the symbolism isn't a positive one. I was wondering that myself. They explained what everything else meant, except the crown. I was hoping someone would see this & explain it me/us. But why is the Crown around the neck? in english heraldry, is standard to put the crown around the neck of a supporter (term for the side animals) in the coat of arms of someone given the rank of duke or duchess. The Duchess worked with the heralds on the design, and approved it. i would not worry about this. And now I can sleep again! The Duchess of Sussex took a great interest in the design. Good heraldic design is nearly always simple and the Arms of The Duchess of Sussex stand well beside the historic beauty of the quartered British Royal Arms. Heraldry as a means of identification has flourished in Europe for almost nine hundred years and is associated with both individual people and great corporate bodies such as Cities, Universities and for instance the Livery Companies in the City of London.